Every so often an author comes along that speaks your language. You know, that book that, as you read it, you find yourself wanting to speak it out loud to an audience so that you can say, “See! Here it is! This is exactly how I feel! This is exactly right!” This was that book for me. I have read several really great books this year and could (and probably will) write about how each one encouraged, inspired or moved me. However, Jenny Simmons’ book, The Road to Becoming, is a book that I’ll remember for a very long time. Jenny Simmons is the front woman for former band, Addison Road. I have always been a fan of their music (especially the song, Hope Now) and you know I love a good female-led band, but I have to say that what Jenny pours out in this book, for me, is her very best and most important work so far. The book is a memoir of sorts, taking the reader through the author’s own journey to becoming. From her earliest memories and dreams, through the heartbreaking end of her band, through a period of waiting and eventually to a beautiful rediscovery of her purpose and calling. It’s so obvious that Jenny (that’s right, we’re best friends now) is a songwriter and lover of lyrics as her writing feels very poetic and artistic throughout the book. Every word seems carefully chosen and thoughtfully written in a way that only an artist could do. Do you remember that scene in The NeverEnding Story, near the end, where Bastian is reading the story and suddenly realizes that the narrator is talking directly to him? And then he freaks out and throws the book down until he can gather enough wherewithal to pick it back up again? This is exactly how I felt reading that chapter. Jenny Simmons was talking directly to me! Felt a little spooky if I’m being entirely honest. As she is describing her own dream, it felt as though she was describing mine as well. I wish I could describe how I felt reading those words. I think mostly I just felt that I was not alone. For the very first time it felt that someone had put words to my own thoughts and feelings about grief. This is so very true and right! In another section of the book, she talks about seasons of lostness. Here is one part that I found to be so very beautiful. I could talk for days about the truth in this book. I always say that the mark of a good book is what I call “quotables”. Take a glance through any book I’m reading to see how much hi-lighting or underlining I do and you’ll know if it’s a good book or not. There are “quotables” in every chapter of this book and on nearly every page. There is so much to take in that it often felt like I needed to slow down and make note cards just so I could really absorb all this book has to offer. The themes of purpose, grief, resurrection, hope and grace fill the pages. I was moved by the stories, encouraged by the lessons learned and inspired to take every bit of wisdom offered here and apply it to my own story. 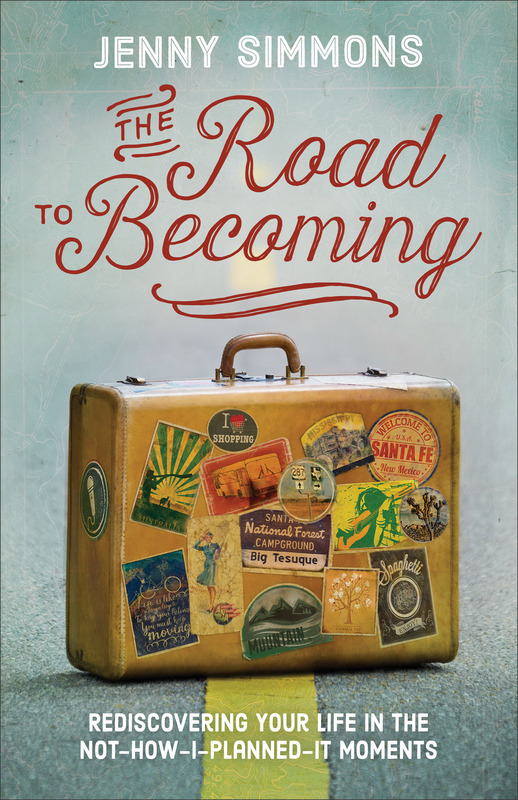 Whatever season you find yourself in, this book will be an encouragement along your journey. You will find comfort for a grieving heart, grace for a worn out mom, hope in your season of lostness or waiting, and a few funny stories along the way. In the prelude of the book Jenny writes, “If nothing more, I share my story to remind you that you are not alone in yours.” (p12) That is exactly what this book does. What a treasure! Disclaimer: I received a copy of this book from the publisher in exchange for my honest review. I was not required to write a positive review. All opinions expressed are my own.